Imagine if we lived on a planet called Earth – where all species that live there are dependent on each other and the Earth to survive. This paradox points to the truth that the survival of life on earth is dependent on our relationship with the Earth and each other. As we currently stand we are playing into the hands of capitalism and we don’t add into the equation of unforeseen cost of the Earth needs or perhaps better said Earths rights. Humanity has many things in common – we laugh, smile, cry and bleed. We have in common as does all species and plant form the need for water, food, clean air and a safe place to live – a basic summary of human rights. We all live on the incredible revolving sphere we call earth. The earth provides for us all our needs and we are totally dependent on it for our basic rights. Yet we have used it as an endless recourse rather than investment. Some of the most intelligent beings can calculate with incredible precession profits and loss to calculate and forecast the best investments to gain the greatest returns. Yet it is done without taking into the equation of unforeseen costs of the Earths ability to sustain that demand. The outcome is shortsighted and unsustainable. Yet we continue as business as usual, governments that we elected and huge corporate companies seemingly relentless to trade without taking on board we have this huge deficit that is not taking into the equation – the unforeseen cost – the Earths needs. This is the results of campaigns that began on a grass root level that made humanity sit up and rethink what it is doing to the planet. This is a fantastic result but it does not differ from the need for radical change in how we live together on this planet. 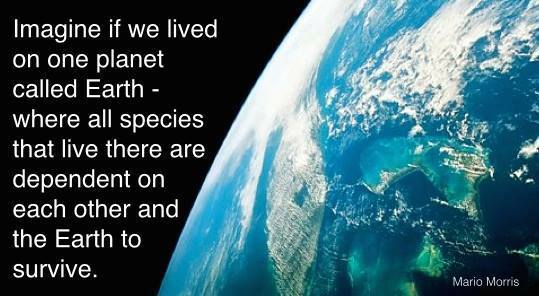 We have more in common with each other than we prefer to give credit to, we all live on the planet Earth. Yet it must start with ourselves looking at how we live. Recycling may seem lost in the scheme of things yet it is a proactive engagement if you like a direct action of showing appreciating for the planet Earth and the community in which we are a part of. Downsizing our carbon footprint upon this planet as we join in a partnership with each other. Yes, we have a lot of work to do which in itself is a great thing. We need governments to change or more importantly we need to change our governments. Governments that serve their own interest outside their appointed office are off target. We need a radical investment into the Earth itself so greed cannot be a driven force behind governments or corporate companies but the Earths needs has to be the primal investment. We have to recognise the Earth as a living organ and we are part of the function of that organ as is every plant life and species upon this Earth is. We are one part of the greater function of the planet earth. Governments, leaders and corporate companies that have their interest and investments interest outside the Earth cannot and should not lead the way. Trade such as arms and nuclear trade, including the trade that creates carbon dioxide has to be lowered, reduced and even irradicated. Deforesting for cattle as we sweep away the earth lungs has to seize and be reversed. We need to invest in renewable energies that replenish far greater into the Earth as opposed to what we can take out of her.